Good habits don’t have to be boring. The picture above is my ‘choices’ bag. I returned from a retreat in October and I wanted to find a more creative way to stay ‘in the gap.’ This is the space between something happening and responding to it. Most of the time we react without thinking about it. I have been meditating and practising mindfulness for over 10 years now and one of the downsides is that I am very aware of my bad habits! I am learning to be kinder to myself and instead of beating myself up replacing them with better ones. It is much harder to stay with our experience when we are upset or bored so we find something to distract us – usually something addictive like social media, alcohol, cigarettes etc. 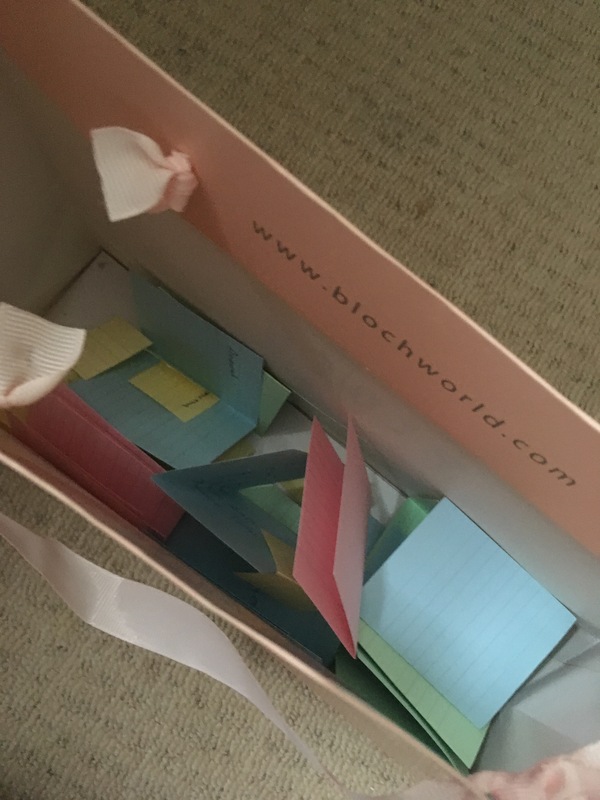 In my choices bag are coloured cards. On the yellow different meditations, the pink different forms of exercise, the blue different writing activities and the green different inspiring ideas of something to read. I keep it by my bed and I pick out one of each colour as soon as I wake up. I am not one for a day to day routine so this works for me because I love stationery and I don’t know what I am going to choose it makes each day’s activities different. It can be hard to stay motivated when you are working at home. Another reason it works is that of course I have only put on the cards things I enjoy doing. There is no point me putting going to the gym on a pink card because that will never happen so I have doing yoga, going for a walk or bike ride or swim. Sometimes they don’t all happen so I have to remember to be kind to myself as life gets in the way. However in less than three weeks I have established a daily writing habit, something I was struggling to do before. If you struggle to get motivated please feel free to contact me about coaching. Thank you for reading and have fun today! Another year draws to a close. If I were to make a judgement about 2014 I would probably say it was not a very good year. However is life ever that simple? Yes some pretty awful things happened but so did some wonderful things too. I attended three funerals, all people who had died prematurely including a seventeen year old friend of my son who was killed in an accident. A few weeks previously his father, my ex-husband had dropped dead completely unexpectedly, aged 51. As a mother it is hard watching my son suffer. My instincts want his pain go away and to make everything alright for him. But I can’t. He can only work through his grief himself. Of course he has his teenage moments still and I have learned not to react. There is no point trying to talk to him when he is in a blind rage. All I can do is send him compassion and at the same time let him know that sometimes his behaviour is not acceptable. He even apologised about it once – that is huge progress! You may have read my previous post about the abuse I suffered in my former marriage. What a host of mixed reactions when my abuser died! He had been in the fourth stage of my metta bhavana (loving kindness) meditation many a time and it was at this time the benefits paid off. Of course there has been the usual anger, a little sadness when remembering happier times when we were young but also relief. It feels very strange being the only parent left now. In the depth of the sadness in our household we also received some good news. My sons and I all passed our courses that we needed for various things. That was when it really struck me how you can feel happy and sad at the same time and just because you are grieving does not mean you should not celebrate joyful events too. I went on holiday completely on my own for the first time. I had my purse stolen, fortunately it was the last day, and that made me aware how vulnerable I was. It has not put me off though, next time I will keep my card and my cash separate and I will leave a little cash in the hotel too. Luckily I was not hurt and I got all my money back from the bank. If anything it has made me more determined, I need to go back and visit Ravenna! In our darkest moments we can connect to our imagination and creativity. I finished the draft of my novel and certain events of the year have given me inspiration for the next one. Here’s wishing an inspirational 2015 to everyone. They say it takes 21 days for something to become a habit – 2 down 19 to go. I looked back over what I had written yesterday and I could not remember much of it – interesting what happens when you write from the heart. As it took the form of a letter I am still in 2 minds whether to send it. Perhaps readers you can leave your thoughts in the comment box below. Today I have been writing about happiness and my take on it – a big subject and loads more to say! Following on from yesterday’s post I said I had decided I was going to write a book. Although I have lots of ideas I don’t know yet what it is going to be about specifically. After meditating this morning I was talking to one of my friends and he said he had been thinking about writing a book too. We discussed ways about going about it and decided that it was probably best just to write something every day. I believe that is what professional writers do even though they may not be feeling inspired. So I took my laptop and sat in my living room having set the timer on the cooker for 25 minutes and started writing. We had discussed the merits of writing by hand or typing. I originally thought writing by hand would be better but then decided against it because my handwriting is not very legible! Also this way I can keep it all in a folder on the laptop, in date order and see how it evolves. I just wrote from the heart and what came up did surprise me slightly. I am not going to say exactly what because it was quite personal. I realised after I had written a couple of paragraphs that I was actually writing a letter. I didn’t edit it at all. I’m not sure if I will send it but the universe knows I have written it. Can’t wait to see what happens tomorrow!